I listened to the unabridged audio version of The Alice Network by Kate Quinn and narrated by Saskia Maarleveld. Listening time for The Alice Network by Kate Quinn is 15 hours, 6 minutes. I am a fan of historical fiction novels, so I eagerly downloaded The Alice Network by Kate Quinn and began listening to this novel. 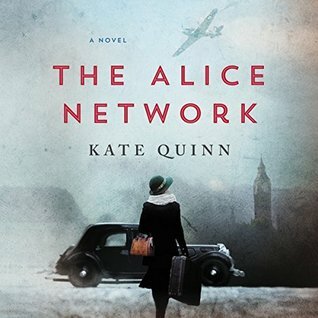 I was hoping that The Alice Network by Kate Quinn was going to be an excellent read, especially with all the wonderful ratings of it I discovered on Amazon's website. However, I felt that the The Alice Network overall was a slow read the first half to two-thirds of it before it picked up the pace. I also enjoyed listening to Saskia Maarleveld narrate The Alice Network by Kate Quinn. I enjoyed the premise of The Alice Network along with chapters alternating between the viewpoints of the two leading female characters, Charlie St. Clair and Eve Gardiner. Each chapter weaves the past and present until the time line converges into the current time line set in the novel. I did find the story line for The Alice Network to be a bit predictable for the most part. But there were a few surprises, which was pleasant to discover. A couple of the scenes seemed far fetched, but I'll chalk it up to creative license. I found it a tad annoying that the discussion/reference of girls being easy/sluts if they slept around and became pregnant prior to marriage in various parts of the novel early on because it seemed to be brought up a quite a few times. Fine make the point that this how people felt during this time period, but move on! Instead, the topic seemed to surface during the first half (roughly) of the novel. I also disliked that Charlie kept repeatedly referring to her pregnancy as her 'little problem' throughout the early part of the novel... Again, I found it really annoying to keep hearing this phrase a lot during (roughly) the first half of the novel. The Alice Network by Kate Quinn is overall a decent read. By the end of The Alice Network, I did like it, but it was not a novel I loved. It wouldn't be a novel that I would highly recommend. I am giving The Alice Network by Kate Quinn a rating of 3 stars out of 5 stars. Oh dear. I will be reading this one in June for a reading group. It'll be interesting to see what you think of this novel.